Some people develop low back pain that does not go away within days. This may mean there is an injury to a disk. Small tears to the outer part of the disk (annulus) sometimes occur with aging. Some people with disk tears have no pain at all. Others can have pain that lasts for weeks, months, or even longer. A small number of people may develop constant pain that lasts for years and is quite disabling. Why some people have pain and others do not is not well understood. 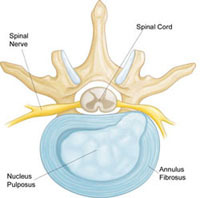 Another common type of disk injury is a “slipped” or herniated disc. A disk herniates when its jelly-like center (nucleus) pushes against its outer ring (annulus). If the disk is very worn or injured, the nucleus may squeeze all the way through. When the herniated disk bulges out toward the spinal canal, it puts pressure on the sensitive spinal nerves, causing pain.